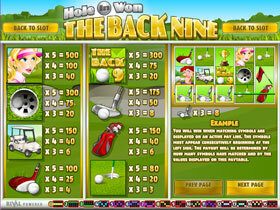 Hole In Won - Back 9 is one of Rival's new I-Slot. This slot is the sequel to the former Hole in Won I-Slot which is full of high quality stunning graphics with rich background sound effects and music. The game starts with an introduction movie clip that shows a Man Golfer playing Golf. Many people who enjoy Hole In Won - Back Nine will also love the choice of games at Fruity Reels where there are over 100 titles to enjoy. The whole reel symbols on this slot are excellent animated 3D quality that reflect its theme perfectly. The symbols include; a Woman Golf Player, a Man Golfer, a Gold Ball in the Hole, Golf Cart, Wood Club, The Back 9 Logo, Iron Club and Ball, Golf Ball inches from the hole, Red Flag, Trophy, and Golf Bag. The Wild symbol is represented by the Red Flag. This symbol substitutes for all symbols except the scatter to make winning combination. The Golden Trophy is the scatter, the Man Golfer is the bonus symbol. The highest payout comes out by getting 5 of the scattered Golden Trophy symbol. 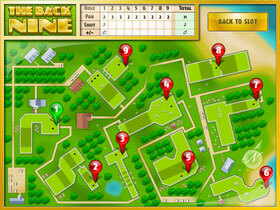 Hole In One - Back 9 has a pleasant background sound track. The name of this i-Slot comes from the bonus game that this slot offered which can be triggered by getting three or more Man Golfer symbols. During this feature players are taken to a second screen where they will be taken to the first of The Back Nine holes on the golf course and will need to first try and complete this hole. 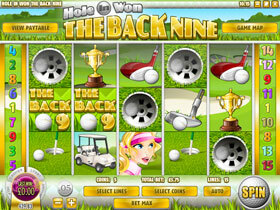 The Hole In One - Back 9 slot will suit both lovers of Penny Slots and High-roller slots as the coin sizes start at $0.01 and go right up to $1 with a maximum bet - per reel spin - of a massive $75. Many online sportsbooks offer free bets to punters, so why not use their money to increase your bankroll and betting power using this free money? Have a read through No Deposit Bonus Codes For Sportsbooks and learn how to use the free bets to your advantage. Alternatively, Tips And Tricks For Internet Betting and Online Betting And Bankroll Management are also some great resources to help increase your winnings.